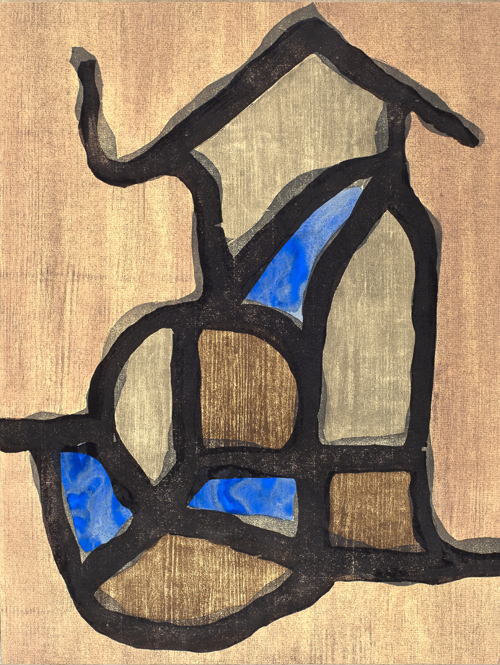 David Krut Projects is pleased to present Chuck Webster’s first solo exhibition with the gallery and launch of Cathedrals I-VI, a suite of six woodcuts published by David Krut Projects in collaboration with Master Printer, Phil Sanders. The exhibition will additionally include three hand worked woodcuts, two drawings, and a suite of five lithographs, created in collaboration with Sanders and published by PS Marlowe. This newest series, Cathedrals, is a celebration of the aesthetic experience of a priori forms. These works are built on the concept of the church as a place where the physical and the ephemeral coexist and occasionally collide. Cathedrals, considers the materiality of the structure of a church – the stone, glass, and wood – as being as important and integral to its history as the hands that built it and the hands that pray within. Webster’s work is best observed through a play on figure ground relationships – where some marks melt into one another while others exist as thick black lines that either hold the ground or break it apart. Initial inspiration for Cathedrals came from Picasso’s linoleum cut rinses and his collaboration with Pierre Reverdy, Le Chant des Mortes. Later conversations included Terry Winters’ Graphic Primitives and Victor Hugo’s walnut ink wash drawings. References to these works can be felt throughout the series, as can Webster’s passion for experimentation with new processes and combinations of materials. The processes required to make the Cathedrals suite include letterpressed woodcut, pochoir, paper toning (á la Picasso’s rinses), editionable watercolor, and hand applied walnut ink. The woodblocks used were veneered with white oak, maple, bubinga, zebra wood, birch, and douglas fir. The majority of inks and watercolors were hand-made, mulled from specific natural pigments. The walnut ink was crafted specifically for this project from this summer’s crop of nuts, and the papers were produced by the fourth generation Zerkall-Buetten mill in Germany. Born in Binghamton, NY, Chuck Webster received a BA from Oberlin College in 1992 and a MFA from American University in 1996. The artist’s work can be seen in numerous public collections, including the Metropolitan Museum of Art, New York, NY; Whitney Museum of American Art, New York, NY; Baltimore Museum of Art, Baltimore, MD; the Museum of Fine Arts, Houston, TX; the Dallas Museum of Art, Dallas, TX; and The Beinecke Library at Yale University, New Haven, CT. He has been the recipient of numerous awards and grants, including the Milton and Sally Michel Avery Visual Arts Fellowship, at Yaddo, 2010 and 2000; the MacDowell Fellowship, Peterborough, NH, 2004; and the Winter Fellowship at the Fine Art Works Center in Provincetown MA, 2004. Webster’s children’s book, made in collaboration with Arthur Bradford titled, 43 Monsters and published by Manic D press, is available worldwide. An exhibition titled, Bulldog Skins opens at Zevitas Marcus in Los Angeles on November 7, 2015. Webster lives and works in New York City. Please email info@davidkrut.com for more information.